The building dates back to the year 1485 when it was built on a field donated to the community by Samuel Melli and is therefore the most ancient synagogue in Italy still working in the place of origin. The house, before the Second World War was undistinguishable from the others, except for its bigger size. Today two epigraphs are set on the side of the door reminding the victims during the years 1943-45. In the entrance-hall a small staircase leads to the "Fanese School", a small synagogue of the 19th century still in use, where there are precious pieces of furniture like the "Arעn" in polychrome marbles and wood dating back to the 18th century. Particularly fine is also the elegant door, coming from the synagogue of Cento. From the courtyard, where there are the pillars used for the celebration of "Succעt" (of the huts), starts the main staircase, with plates reminding illustrious people of the community. Upstairs there is the German School, still in use, that in the past was the Aschenazite Synagogue. Inside there is a 17th century altar decorated with a floral motif and stucco decorations on the walls dating back to the 19th century. Above the entrance a grating protects the Women's Gallery, no more in use, but visitable. Another flight of stairs leads to the halls where there was the Rabbinical Court and the great hall of the Italian School, no more in use. All these rooms have memorial tablets and furniture saved from the destructions of the nazifascists: some pieces of furniture are original of this building, other come from places of worship which don't exist any more. For instance the "Spanish school", that was located in the nearby Vittoria street. The building of the synagogues houses the Jewish Museum. The origins of the Jewish community in Ferrara are very ancient and the city boasts a tradition of religious diversity. Many groups of Jews, driven out of their native countries - Spain (1492), Portugal (1498) and Germany (1530) - were welcomed by the Este family. They settled in Ferrara and created a strong and well-organised community. The ghetto was set up in 1627 by the papal government which, after the devolution of 1598, ended the previously liberal policy. The area set aside included the present Via Mazzini, Via Vignatagliata and Via Vittoria. At no. 95 on Via Mazzini the building of the Synagogues still stands, donated to the Jewish community in 1485 by Ser Samuel Melli and recognisable by the stones which recall the massacres of the Second World War. The centre of Ferrara, with its narrow winding streets is perfect for a walk. Our tour today starts from Piazza Trento Trieste and takes us along the side of the magnificent Cathedral towards the Jewish ghetto, where the Jews lived in segregation from the rest of the city from 1627 to 1859. Our first stop is in Via Mazzini, in the heart of the ghetto and home of Ferrara's Jewish Museum. You can visit the museum any morning between Sunday and Thursday (guided tours only). The inscriptions outside the museum pay tribute to those who died in the Holocaust, a sharp contrast to the tolerance of the Estense family who had welcomed the Jews with open arms some 500 years earlier. The Jewish Cemetery: Leaving Via Mazzini (once Via dei Sabbioni) behind we head for Via Vignatagliata and then on towards Via delle Vigne and its atmospheric old graveyard "The Jewish Garden" (Orto degli Ebrei). Ring the bell to visit, the cemetery is open every day except Saturday. we can walk along the city walls, built at the end of the 1400s by Biagio Rossetti to defend Ferrara against the Venetians. The walls run for almost 9 kms and make for a most pleasant stroll or cycle. Look out for Porta degli Angeli, the door through which the last Duke of Ferrara passed before the city fell under papal rule. You'll also notice four monumental ramparts between San Giorgio and Porta Paola which, along with innumerable other treasures, helped put Ferrara on UNESCO's World Heritage List in 1995. Open: only guided tours from Sunday - Thursday at 10.00-11.00-12.00 am. The museum is part of a tour including the visit to three synagogues. It is housed in four halls and keeps silverware, fabrics, furniture, documents, and other objects dating back to the 18th-century onwards. Eight showcases exhibit a series of objects and pictures concerning the major Jewish community's feast-days. Remarkable exhibits: The Scrolls of the Law, and the great candlestick used in the Temple during the feasts of the lights. Two rooms, recently opened, illustate the history of the Jewish community of Ferrara through documents dating from the 15th-century up to the deportation during the Second World War. Of particular interest are the "keys" of the Temple which were used to close the doors of the Jewish ghetto and some 18th-century publications by Isacco Lampronti. The Jewish Museum of Ferrara is located on the last floor of the building of the Synagogues. In the first room there are objects of different periods, divided according to the different periods of the Jewish religious life: particularly interesting a ceremonial silver plate used in redeeming the first born ("Pidiעn"), and a set for circumcision, with all the metallic objects and the small clothes for the newborn. In a show-case there is one of the peculiar "seals" which the Jewish in Ferrara used to mark the grave to avoid the stealing of corpses for the University. On one side of the room there is a reconstruction of a small temple, with precious furniture like a form dating back to the 15th century and a polychrome carved "Arעn" coming from Cento. In the centre of the second room there are eight show-cases each one representing one of the main Jewish festivities and containing objects and images related to each specific solemnity; all around one can admire metallic objects (most of them in silver) of exquisite workmanship. The most numerous are those used to decorate the Scrolls of the Law when they are laid in the Arעn: crowns ("Atarעth"), decorations for the Torah scrolls ("Rimmonלm") and plates ("Tas"). A Hanukkah lamp is still used in the Temple during the celebrations of "Hannukkא" (Feast of lights). On a wall there is the representation of the Easter Supper ("Sטder"), a work in mixed technique by Luzzato. The two last rooms display objects related to the life of the Jewish community of Ferrara, from the old past until nowadays. Not to be missed: the keys of the Ghetto, once used to close the gates of the Jewish quarter, the original 18th-century editions of the work of Isacco Lampronti, great Ferrarese physician and talmudist, and, finally, two books published by Abraham Usque, one of the main Jewish typographers of the Renaissance in Ferrara. The guided tour of the Museum includes the visit to the three "schools" or synagogues and to the women's gallery of the German Temple. FERRARA, Italy - Between the mountains of Northern Italy and the enchanting Tuscany region, the River Po makes its way towards the Adriatic Sea, ending up in a majestic delta south of Venice. Lined up along its meandering course are the "golden towns" of the Po Valley: Cremona, resounding with the sweet sounds of the Stradivarius violins; Parma, the favourite adopted home of Verdi; Mantova, of Rigoletto and Virgil fame; Padova, the site of one of Europe's oldest universities; and finally Ferrara, at one time rivaling mighty Venice herself: a town of art, magnificent palaces, shaded alleys and fair gardens, with a rich history and a bustling cosmopolitan present. My husband, Robert, a travel photographer, and I arrived in Ferrara on a bright spring day. We proceeded to visit the requisite tourist sites, starting with the imposing 14th century Estense Castle, of the Este family, its red walls dominating Ferrara's medieval city on one side and its Renaissance counterpart on the other, and surrounded by 500-year-old city walls and huge parks and golf courses. Just across from the cathedral, we faced the statue of the Duke Borso d'Este, whose column had been built from the tombstones of the two Jewish cemeteries; images of the original Hebrew inscriptions are kept in the archives of the Jewish Museum of Ferrara. Walking through the Piazza delle Erbe - the medieval herb market - we stepped right into the old Jewish ghetto, within the triangle formed by the current Via Mazzini, Via San Romano and Via Vittoria, a maze of narrow alleys and medieval houses. From about 1100 CE, the story of Ferrara was closely intertwined with that of its Jewish community. First settling next to the fortified walls, the ever-growing community soon moved into the heart of the medieval town. For centuries, Ferrara was at the confluence of three Jewish immigration currents: from Rome, from Germany and from Spain; in 1492, Ercole I d'Este invited the Sephardi Jews expelled from Spain, thus acquiring for his city the advantages of the Sephardi culture. The Jews fared much better in Italy than in the rest of Europe and, accordingly, Jews in the Ferrara community were represented in a wide range of occupations, including such famous individuals as Abramo Usque, who produced the Ferrara Bible, and Isacco Lampronti di Ferrara, who wrote the famous talmudic encyclopedia Pahad Izchak. Between 1627 and 1859, the Ferrara Jews were restricted to the ghetto, a self-sufficient small town within the larger one. With a population of about 1,800, the ghetto had its synagogues, schools and old age homes. In 1848, King Carlo Alberto proclaimed the emancipation of the Italian Jews, granting them equal rights. The gates of the ghettos were opened - Rome being the last one in 1871 - and the Jews assumed their "rightful place" in society. Within the next century, the Ferrara community produced its own luminaries, such as Joseph Bassani who lived in, and wrote about, Ferrara. Today, the old ghetto area, with its small attractive stores and refurbished colourful houses, is an essential part of the itinerary of all guided tours. We had the honour of receiving a personal guided tour of the Ferrara synagogue - an unassuming three story building with green shutters and an arched doorway flanked by two large commemorative plaques - from the leader of the Jewish community, Rabbi Luciano Caro. Though we had arrived just as the rabbi was leaving, he invited us in and shared with us - in the common language of Hebrew - its and the community's history. The synagogue building, which was donated to the community in 1485, included three congregations: Italian, Ashkenazi and Sephardi. 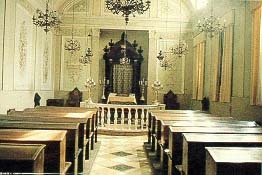 The Italian synagogue was destroyed in 1944 by the fascists; once a Beit Knesset Hagadol, it is now used for festivities and special occasions. The building, or rather the complex of buildings, includes the Jewish Museum, which offers general community information as well as guided tours of the synagogue and the ghetto. After the war, the building was not deemed worthy of restoring as the community had shrunk considerably. People had left over the years, looking for work elsewhere, and after the Holocaust took its heavy toll, few people returned. Currently, there are about 100 Jews in Ferrara, mostly older people. Rabbi Caro led us to the building's second floor, where a small synagogue is open for regular services, and also serves as a school for the five or six Jewish children in the town. He then led us up and down a few flights of stairs to the former Ashkenazi synagogue. Beautifully kept, with polished wooden benches and gleaming brass candelabra, the synagogue is used only for the High Holy Days. An old plaque on the wall, dated 1652, states that the community had to pay the church a certain amount of monies each year, otherwise they would be chased away. "It was a famous and large community," Rabbi Caro said. A "travelling" rabbi, he is in Ferrara three days a week, from Friday to Sunday, providing religious services on Shabbat, as well as instruction for the young people, and whatever else the community needs. He also conducts services in Parma and Mantova. As we said our goodbyes to Rabbi Caro and had a last look at the synagogue, I thought of the two Magen Davids gracing the cathedral. Yes, the Jewish community of Ferrara must have been truly a notable one. 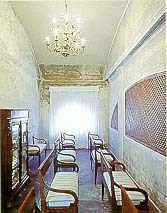 For information on Ferrara: Comune di Ferrara, Corso Giovecca 23, Ferrara, Italy, phone: 37-0532-209370, fax: 37-0532-212266. Since 1485 the building in Via Mazzini has been the centre of Jewish life in Ferrara. At that time the Jews had no permanent place of worship. 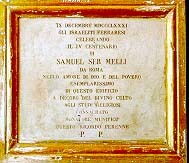 Such a place was provided by (Mes) ser Mele (Melli), from Rome, son of Salomone, who had moved from Mantua to the Estensi court in Ferrara as a financier. Having no children, this benefactor dicided to spend his entire wealth (1,000 ducats) to purchase the building in via Mazzini (once called via Sabbioni). Upon his death the building was willed "forever for the common use of the Jews". Since then the building, with in three synagogues - the Scola Tedesca and the Scola Fanese which are still operative and the Scola Italiana - has beeb the focal point for the Jews' life in Ferrara. today houses the three synagogues and the museum. This is the most important synagogue in the building and is still used for all the most important holidays. The stucco decorations on the walls were probably the work of Gaetano Davia, the author of the decorations in the Municipal Theatre in Ferrara. The Seventeeth Century altar is decorated with a floral motif. 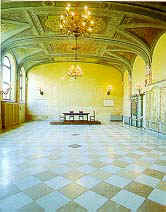 The large hall of the Scola Italiana, now used for cultural events. לפי ידיעות שבידינו היתה נוכחות יהודית בפירארה, עיר בצפון איטליה, החל מהמאה הי'ג. בתקופת הרנסנס פירארה היתה מרכז יהודי חשוב. הוקם בה בית דפוס עברי מפורסם. בפיררה מצאו מקלט גולים מספרד (1492) וממרכז אירופה(1553). עם הקמת שלטון הכנסיה בעיר, הורע מצבם של היהודים שרוכזו בגטו וחויבו לשאת את אות הקלון. רק בשנת 1859 הוענקו ליהודים זכויות האזרח וחופש מלא. חיי היהודים היום מתנהלים סביב לבניין שנבנה לפני חמש מאות שנה בתרומת נדבן יהודי מרומא העוסק בבנקאות ושמו שמואל מילי. בתוך הבניין נמצאים בתי כנסת מפוארים, משרדי הקהילה, מקווה ואולמות שונים. בשנת 1997 נפתח בו מוזיאון יהודי המציג חומר מעניין על קורות הקהילה. כדאי לציין שבני הקהילה העניקו ליהדות עושר רוחני ראוי לשבח. בפררה חי במאה הי"ח יצחק למפרונטי, רב ורופא, מחבר האנציקלופדיה הידועה: "פחד יצחק".